THE MOMENT OF TRUTH: Game Giveaway! Win It! 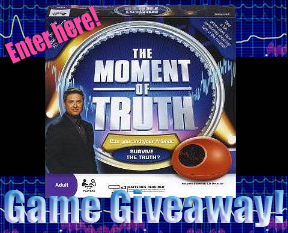 If you’re a fan of “The Moment of Truth” or know someone who is, it’s the perfect time to enter our contest to win one brand new, factory-sealed home game version! With rumors circling around that this FOX game show may return to maybe even a different network, this is a fun opprotunity to brush-up on scandalous topics as you and other players test each other on truths about your lives! This game includes a “toy biometric lie detector”! “Can you and your friends survive the truth?” Play with 3-6 players. Game requires three AA batteries not included. Game also includes: 100 question cards, 10 pass tokens, 10 overrule tokens, 6 pawns, 6 pawn stands, pyramid scoreboard, and rules. To enter this contest, you must leave us you comment on why you either like OR not like to see “The Moment of Truth” return to television at the end of this post, or on our facebook page. Also, “Like” us on Facebook and send a tweet on Twitter. I do not want Moment of Truth to return to TV, because I want to see Mark L. Wahlberg in a vehicle that supports his talents. Bring back Russian Roulette! I want it to return because I loved watching it with my family<3!! !